One of the most important things you can do to support your spiritual path is to learn how to raise your vibration. Raising your vibrational frequency results in a positive shift of your feelings, thoughts and even impacts you at a cellular level, in your physical body. 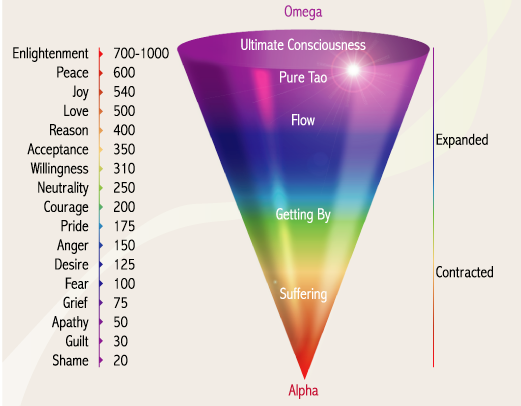 This is an illustration of the Omega Consciousness scale, which depicts the frequency (in hertz) of our different emotional states – low frequencies are at the bottom of the funnel (alpha), and high frequencies are at the top (omega). Notice that the state of Peace is higher than Love. Peace is defined as freedom from disturbance or a state of tranquillity. As you move up the frequency scale, you will experience expanded amplified feelings, which contrast with the restricted feelings lower down. Raising your vibrational rate will have a ripple effect not only on you but on the people you encounter in your daily life. By consciously creating this shift, you are opening the door to leave your Divine imprint. Your frequency affects every area of your life. It is the energetic charge you release that creates the reality you experience. Your vibrational rate emanates from the accumulation of your beliefs, thoughts and your conscious awareness of the present moment. As a result, it magnetizes situations and people that come into your arena. How do you change your rate? Begin by implementing daily and weekly protocols that you can integrate into your everyday life. Here is a list of ideas to get you thinking and started. Give yourself the time and space to experiment with these activities to see what works for you and fits into your lifestyle. After a few weeks, I’d love to hear from you about your experience.